Watch today at 22:00 on Channel 24. In the August poll by the Rating group, the leader of Hromadska Posytsiya Anatoliy Hrytsenko ranked sixth with 7.5% support in the presidential ratings. The survey of electoral sentiments by the Gorshenin Institute in February gave him 10.6%, which placed him fifth among the leading top politicians. Despite not being elected to this parliament, Anatoliy Stepanovych continues to lead an active political and social life. In February, Hrytsenko joined the anti-corruption movement of Mikheil Saakashvili, but did not participate in the creation of a party on the basis of the movement. Why? What are his further plans and political ambitions? Which of the accusations by military prosecutor's office regarding the reduction of the army's defense capability are worth talking about? 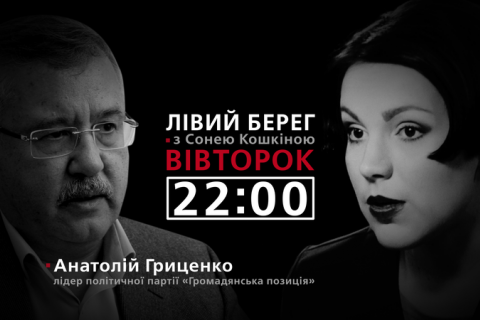 Anatoliy Hrytsenko will answer these and many other questions today, on 27 September, at 22:00, on Channel 24.